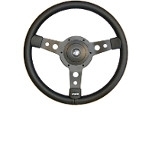 Mountney Steering Wheels suitable for Land Rover Defender. Special Price Inc. VAT: £45.76 Inc. VAT: Info UK VAT charged at 20%. Ex VAT £38.13 Ex VAT Info Outside of EU and EU VAT registered companies only (not UK). Special Price Inc. VAT: £39.20 Inc. VAT: Info UK VAT charged at 20%. Ex VAT £32.67 Ex VAT Info Outside of EU and EU VAT registered companies only (not UK).